Video posted by ABC7’s Laura Anthony. 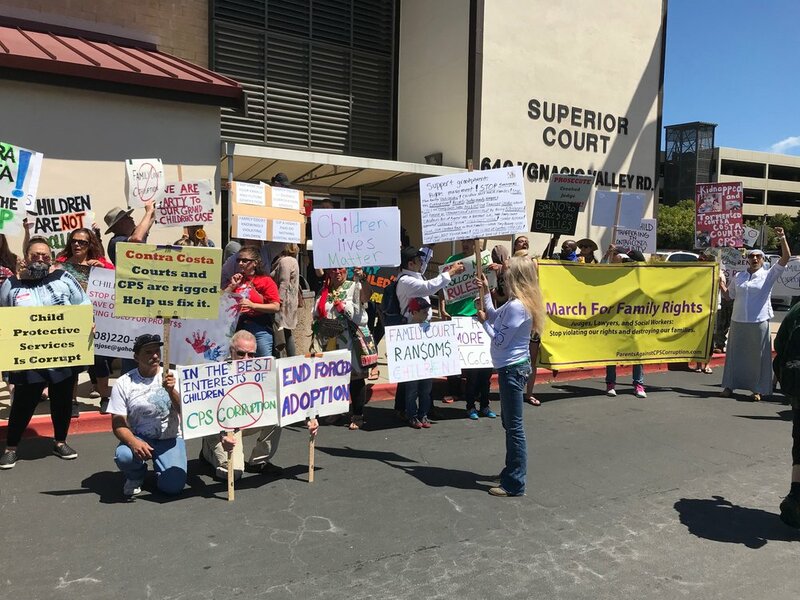 One week after a family court protest resulted in a disturbing arrest in Santa Clara County, court victims in Contra Costa County held a massive family court and CPS protest of their own. 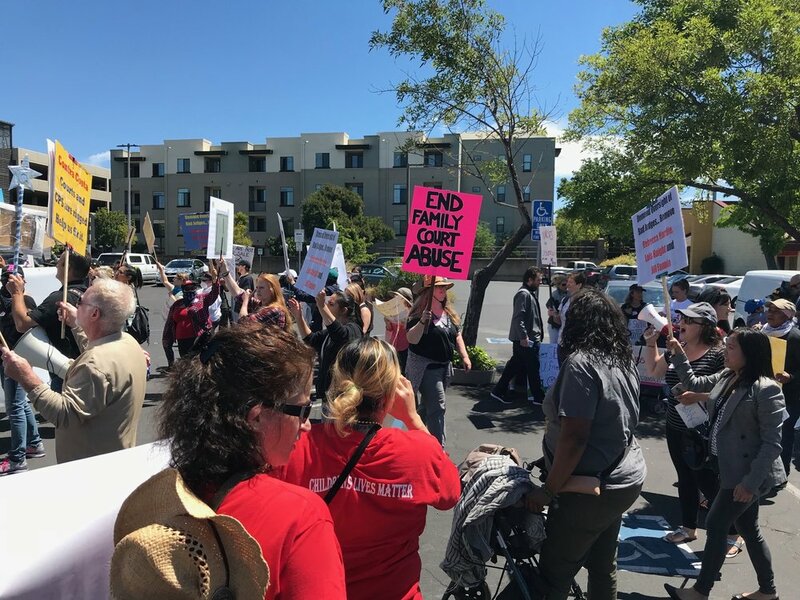 On May 8, court victims and their supporters formed a united front and marched from Civic Park to the Walnut Creek courthouse. Dozens of cars honked in support, bystanders approached the group, exchanged information, and one set of parents leaving the courthouse even joined the ongoing protest. The protests bring home the reality that corruption doesn't just exist in our nation's Capitol, it's in our state and county governments, and even our local courts. An absence of local press coverage on court cases has created an accountability vacuum filled by bad actors. But that lack of coverage is coming to an end. Despite being a heavy news day, the march was covered by local San Francisco Bay Area ABC, CBS, and FOX news stations during their evening and nightly broadcasts. The court reform movement is not going away. Just the opposite, it's growing rapidly. Court victims are finding each other, connecting, communicating, engaging, and organizing through social media. Emails, text messages, FaceTimes, and phone calls calcify introductions made electronically. In-person gatherings commence. Plans are made. Action happens. They fear retaliation for speaking out. Through social media, court victims are realizing there are thousands more just like them. 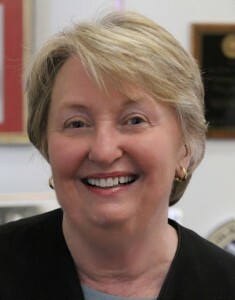 The same players are often involved: certain judges, attorneys, mediators, social workers, or expert witnesses appear in cases, carry out the same racket, and pervert justice. The judges atop the ladder see what's happening and either do not care or worse, are complicit in the perversion. The protest, led by Parents Against CPS Corruption, has threatened recalls against three Contra Costa County judges, accused of violating parents' rights to due process, failing to follow the law, and colluding with attorneys and experts to remove children and take custody away from good parents based upon false or fabricated information: Rebecca Hardie, Lois Haight, and Jill Fannin. It is a common misbelief that judges order parting spouses each receive half of their community property and share custody, or that children can only be taken from a parent if they are a drug addict, alcoholic, or violent criminal. Every day, the lives of good moms, dads, and kids are destroyed by the courts. Parents going through divorces and CPS cases regularly suffer depression, anxiety, and financial destruction. Many develop debilitating mental health problems that move them from productive, taxpaying members of society to being on the receiving end of public benefits, collecting disability and food stamps after having lost their home and their job. "A" students drop off the honor rolls, disengage from friends, and withdraw from extracurricular activities. They suffer as much, or more than their parents and they are helpless to do anything about it. Their hopes, dreams, and families, are ripped apart at the seams and their college funds are laundered to lawyer trust accounts, aided and abetted by public officials sitting behind a bench under a black robe. When parties, attorneys, and social workers lie, commit fraud, and fabricate information and a judge ignores the obvious frauds to make a ruling that decimates a parent financially or takes a child away from a healthy, loving parent, there is an explanation. But it's an explanation too troubling for the public to believe: our judicial branch is no less corrupt than a Trump or a Clinton administration, choose your clan. Foul play exists everywhere. Litigants feel it in their case, but they can't prove it. How could they? They don't have access to the emails, phone records, or bank accounts that could prove foul play, or not. Short of an insider turning on the racket, no district attorney or attorney general will investigate, casting aside thousands of complaints as "disgruntled litigants." All judicial decisions, they say, are proper. If you don't like it, take it to appeals. But technology is now exposing people and patterns, which is the first step to breaking the cycle of corruption. Realizing their problems are the same, individuals are finding others and forming small groups. Small groups are coalescing into larger alliances. Here's what happened when an alliance came together. 9:17 a.m. Organizers and early arrivals gather and set up. Organizers and early arrivals gather at Civic Park in Walnut Creek, California. Carrying banners, signs, food, drinks, contact lists, letters, envelopes, stamps, and courage, organizers lay claim to the picnic tables at Civic Park. An unnamed attorney supporting the movement arrives with four gallons of coffee from Panera Bread. Others begin to arrive by car, BART, Uber, and on foot, carrying their own signs and bringing food for the post-march gathering. Fearing retaliation, some protestors arrive in ski masks, bandanas, hats, and sunglasses. Another unnamed attorney supporting the movement arrives and speaks with marchers, discussing possible litigation. 11:03 a.m. Victims share their stories, news teams arrive. Organizers and marchers contact news organizations several days prior to the event and sent out press releases. It is a success and the major Bay Area news channels arrive. FOX is first on the scene. CBS and ABC follow. Investigative reporter Lilia Luciano of ABC Sacramento arrives and records a Facebook Live broadcast. Luciano has been investigating family courts for two years and has an ongoing series on ABC. Protestors didn't include just parents. Grandparents, friends, school counselors, lawyers, and nurses who have seen the destruction of families by the courts also showed up in support. 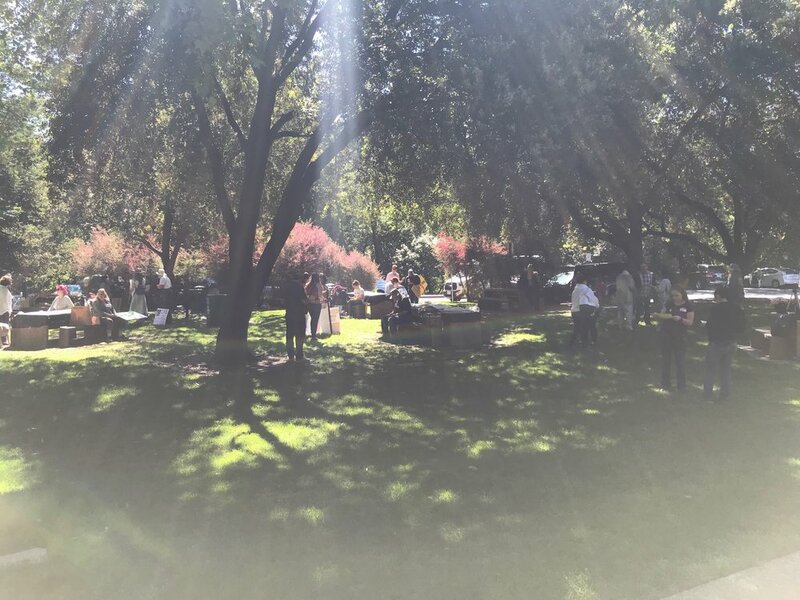 ABC, CBS, and FOX capture the scene at Civic Park in Walnut Creek, California. "Transparency! Accountability! Our kids are not for sale!" The group leaves the west side of Civic Park and then turns north on North Broadway, still chanting in unison. The Walnut Creek Police Department, which organizers had contacted ahead of time, were ready with motorcyles and SUV escorts to ride alongside the group to ensure their safety, and that of passing motorists, at intersection crossings. Thank you Walnut Creek Police Department for supporting First Amendment rights." By the dozens, passing cars, truck, SUVs, work vans, and semis honk their horns in support of the transiting group, some even rolling down their windows to h0wl in support. Employees and customers of local businesses along the route, amused by the unusual spectacle, stop, watch and listen to the protestors, some clapping and whistling to urge the group on. As the group reaches the busy intersection of North Broadway and Ygnacio Valley Road, motorcycle escorts move into the intersection and hold traffic as the large group crosses to the north sidewalk of Ygnacio Valley Road. Getting louder on the final 200 feet of sidewalk, the group turns into the mostly empty Superior Court parking lot. Seeing the group approaching, a well-dressed attorney keeps her head turned down, quickly dashes into her car, and reverses out of the lot before the mass arrives. 12:05 p.m. Protest at Walnut Creek Courthouse. After 15 minutes of protest, the group sprawls across the sidewalk on Ygnacio Valley Road in front of the courthouse. Holding signs and chanting, hundreds of passing vehicles observe the spectacle and the cacophony of honking, chanting, howling, and yelling continues. After a final descent upon the courthouse, the group continues through the parking lot and turns south back towards Civic Park. 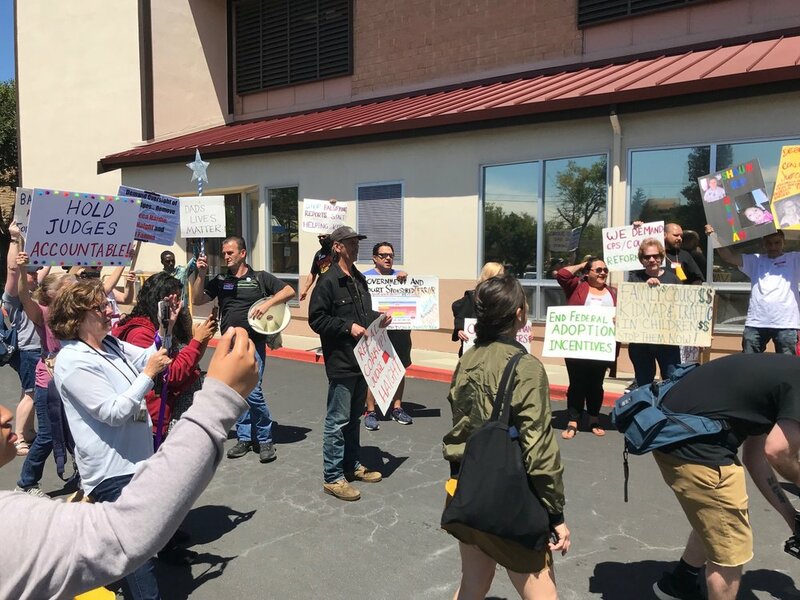 Contra Costa County may have learned a lesson from Santa Clara County's ongoing authoritarian crackdown on protestors: jailing people for exercising free speech provokes more ire and attention than a fleeting protest. 12:49 p.m. March back to Civic Park. After crossing Ygnacio Valley Road, police escorts disband and the group retraces its path down North Broadway and back to Civic Park. The group is stretched for three blocks single file, still chanting, yelling, waving signs. Arriving en masse on the sidewalk in front of the Walnut Creek library, the protestors stage a final rally. Passing vehicles continue to honk. 1:15 p.m. Barbeque, Pizza, Conversation. The group then makes its way in packs back to the picnic ground where hot dogs are on the grill, water, soda, pasta salad, fruit, and other potluck fixings are on display. Eighteen Domino's pizzas are en route. Marchers gather to celebrate a successful protest, comforted by the presence of other court victims, they now see they are not alone. A civil rights lawyer appears and speaks with some of the protestors, eager to hear their stories. He and his colleagues, who specialize in police brutality cases, are exploring a move into CPS and family law cases. He says there are still problems in many police departments and there will always be a bad apple here and there, but cameras have forced officers to clean up their act, so the demand for civil rights attorneys is dropping. Could installing cameras in every courtroom clean up CPS and family law cases? That is an interesting proposition.